What is the ICD-10 Code for Muscular Dystrophy? The ICD-10 Code for muscular dystrophy is G71.0. G71.0 is a billable/specific ICD-10-CM code that can be used to indicate a diagnosis for reimbursement purposes. The 2018 edition of ICD-10-CM G71.0 became effective on October 1, 2017. Muscular dystrophy (MD) encompasses a group of more than 30 genetic diseases characterized by progressive weakness and degeneration of the skeletal muscles that control movement. The particular form of muscular dystrophy dictates which muscles are primarily affected, the degree of weakness, how fast they worsen, and when symptoms begin. Some forms of muscular dystrophy are seen in infancy or childhood, while others may not appear until middle age or later. The disorders differ in terms of the distribution and extent of muscle weakness (some forms of muscular dystrophy also affect cardiac muscle), age of onset, rate of progression, and pattern of inheritance. 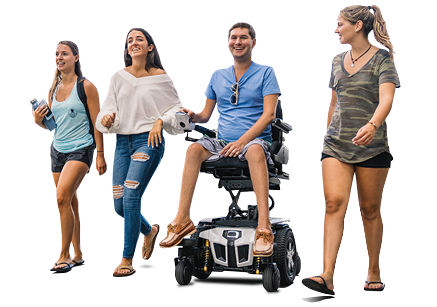 Quantum Rehab, the global leader in clinically-based, user-inspired power wheelchairs, offers technologically-advanced models specifically meeting ICD Codes for muscular dystrophy, including ICD-10 G71.0. For more information, please click here.